Max raised his hand. "It's true," he said, "A few weeks ago I gave my heart to Christ and God has given me love for my parents again. I used to hate them, but since then we've been talking and now I'm going to go visit them. I know God's love is real." When I first met Max he told me that he had lost all feeling towards his parents, but now their relationship has been gloriously reconciled! It's because Max learned the true love of God for him expressed at the cross of Jesus Christ. Only once we see that God loved us despite us, and died for us when we were yet sinners, then and only then can we be filled with His love for others despite them too. Oh, the marvelous love of God! Today I'm heading to the funeral of a young Mormon man who passed away suddenly a few nights ago. He was a student at USU where I will be spending a lot of time preaching in the future. Please pray for his family, that they would see Christ and the hopelessness of righteousness by law. Also today, I will be attending a special lecture at USU by Richard Bushman, the authoritative biographer on Joseph Smith. I'm looking forward to learning more about Smith, the founder of the Mormon church, who is practically deified in this culture. Please pray for wisdom. Much love, beloved. Continue to check the site for updates and thank you so much for all your prayers and support. May God do a mighty work in Utah for His own Name's sake. The following article is adapted from a conversation I had with two Mormon missionaries which really helped in exposing the fundamental error of the LDS doctrine of salvation, namely, that we must by our own effort obtain righteousness through the law of commandments before God will accept us. However, the principles expressed below reveal the demarkation between Biblical Christianity and all other religious systems this world has ever known (not just Mormonism), which is the ancient conflict between faith and works, grace and law, promise and performance; or more directly, God's way versus man's way. May we never compromise the truth of God for the fair feelings of man-centered religion. Jesus Christ is the embodiment of the law. If you want to see what it looks like to keep the commandments of God, look to Him, and He will show you. He is not better than the law; He is its purest example. The writer of Hebrews wrote that our Lord was "in all points tempted like as we are, yet without sin" (Hebrews 4:15), and Christ Himself declared that He had not come to destroy the law, "but to fulfill" (Matthew 5:17). Therefore we have before us a marvelous specimen! Even the most indignant atheist cannot but admire the sheer moral perfection exhibited in the personhood of Jesus. Neither Pilate, the Gentile, nor Herod, the Jew, could find any fault in condemning the man. God's righteous nature, dictated onto stone in the Old Testament, became flesh and blood in the New Testament, "and dwelt among us." The mark, then, for which all men are commanded to hit, by law, is the mark of the Lord Jesus Christ. Keeping the law is exactly the same as being like Jesus in all His moral perfections. The necessary requirement for obtaining righteousness through God's holy law is to fulfill, at all times, every commandment flawlessly as Jesus did, being tempted on every point yet without sin, blameless and without fault before God and man, having the same unbroken moral perfection as was demonstrated by the Law-Incarnate Son of God. He is the immutable mark of God's holy law. The word "sin" in both Hebrew (chata) and Greek (hamartia) means "to miss", like an archer missing the target at which he was aiming. Thus sin can best be defined as "missing the mark". 1 John 3:4 reveals the target that the sinner misses by his sin: "Whosoever committeth sin transgresseth also the law: for sin is the transgression of the law". The very next verse establishes Christ as the indistinguishable equivalent of the law: "and in Him is no sin." Christ, the embodied Law, is the mark, and sin is missing that mark by not replicating Him. Let us bring this picture into sharper focus. "For whosoever shall keep the whole law, and yet offend in one point, he is guilty of all." (James 2:10) The Holy Scriptures show us that nothing less than absolute and perfect obedience to the law of God is of any significance whatsoever. In fact, if a person were to keep nearly all the law, but was insufficiently humble, or felt the least bit of irritation toward his neighbor (or any other sin, it makes no difference), that person would have profited nothing. The same is true with positive commands: "Therefore to him that knoweth to do good, and doeth it not, to him it is sin." (James 4:17) Ceasing from doing all wrong is only half the battle; you must be doing all good as well! One sin, by breaking either a positive or negative command, causes you to be guilty of all. You must hit the mark. A chandelier will come crashing down if only one chain link is broken, even if all the other links remain intact. Missing the mark is to fail the law at any point, while hitting the mark is to be like Christ at every point, all the time. 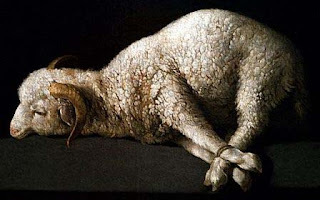 Now to this, one might object by saying that this standard of holiness is far too high for humans to achieve. Such a mark is too good! Too moral! Too virtuous! Surely there must be room for accommodation and compromise? No! A thousand times no! It is only once we begin to see what is the staggering awesomeness of true morality that we shall begin to see the God of Israel as He truly is: He whom Isaiah saw "high and lifted up", owning the ceaseless praise of the thrice-veiled seraphim crying, "Holy, Holy, Holy is the Lord God Almighty: the whole earth is full of His glory". Only such a vision of the highest moral apprehension could force the prophet to cry out in total self-abandon, "Woe is me! For I am undone! because I am a man of unclean lips, and I dwell in the midst of a people of unclean lips: for mine eyes have seen the King, the LORD of hosts." (Isaiah 6:5) Seeing the Lord as He truly is precedes seeing ourselves as we truly are. Beholding His holiness is the prerequisite for bemoaning our own unholiness. When we comprehend that God Himself is the mark of moral perfection to which we are all commanded to hit, we then comprehend the miserable condition of our own wretchedness in "falling short of His glory." Any attempt to lower the mark to accommodate for our own shortcomings is to deprecate and devalue the very God who defines that mark, disgracing the Father for whom Christ commanded us to "Be perfect, even as your Father which is in heaven is perfect." (Matthew 5:48) By lowering the holiness of the mark, we are in fact lowering the holiness of God. Consider an illustration: A man is firing a rifle at a target, attempting to hit the bullseye with every shot. 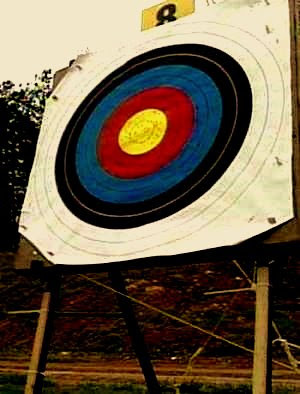 To his great embarrassment, he cannot cease hitting the blue zone which surrounds the center-mark to which he is aiming. With every miss his pride is wounded, until finally, to save himself from humiliation, he remarks to his friends, "I am shooting for the blue!" Rather than admitting that he is a poor shot, he lowers the standard. It is in this same way that men, rather than admitting they are sinners, lower the standard of moral acceptability to save their religious pride. All who are confronted with God's true mark of Christ-like perfection will decide whether they will confess themselves as unworthy sinners, or save their own self-righteousness by daring that God is not as holy as He claims to be. WHY DO ALL MISS THE MARK? "Now we know that what things soever the law saith, it saith to them who are under the law: that every mouth may be stopped, and all the world may become guilty before God. Therefore by the deeds of the law there shall no flesh be justified in his sight: for by the law is the knowledge of sin." (Romans 3:19-20) The knowledge of sin is not merely the awareness that one has missed the mark, but also the understanding as to why one has missed the mark. It is the keen realization of the sin that "dwelleth in me" which drives the guilty man to cry out in self-abhorrence, "O wretched man that I am!" (Romans 7:17, 24) What the Scripture means when it says that "every mouth may be stopped" is that all excuses a man might give to justify himself are dried up, because all concealments that a man might hide behind are gone. The law has revealed that the man is not only guilty, but wicked. As long as a sinner continues to justify his sin, he only continues to expose his own wickedness. Why, then, do all miss the mark? Because all are sinful, selfish, conceited, proud, egotistical, depraved, immoral, profane, licentious, unrighteous, uncaring, ungodly, insensible, brutal, adverse, destructive enemies of God. This, as shocking as it may seem to the unenlightened eye, is the Bible's description of authentic man. We must come to accurately confess ourselves as sinners in light of the holy mark of God's law, which was embodied in the flesh and blood of the Lord Jesus Christ. Unless we are like Christ, wholly like Christ, in all His moral purity and perfection, we do nothing but fall short of God's glory, missing the mark of the righteousness that is by law; and as long as we refuse to acknowledge this bitter but necessary truth, we shall go no further upon the road of reconciliation with God. Have you hit the mark? If not, have you confessed yourself a sinner? Or are you lowering the standard to fit your wounded self-righteousness?